Looking for a fun place with good food and an excellent view of Beloit? Check out The Rock Bar and Grill, situated on the banks of the Rock River in Beloit. “We have one of the best views in the city,” says Barb Lervik, crew trainer for the restaurant. 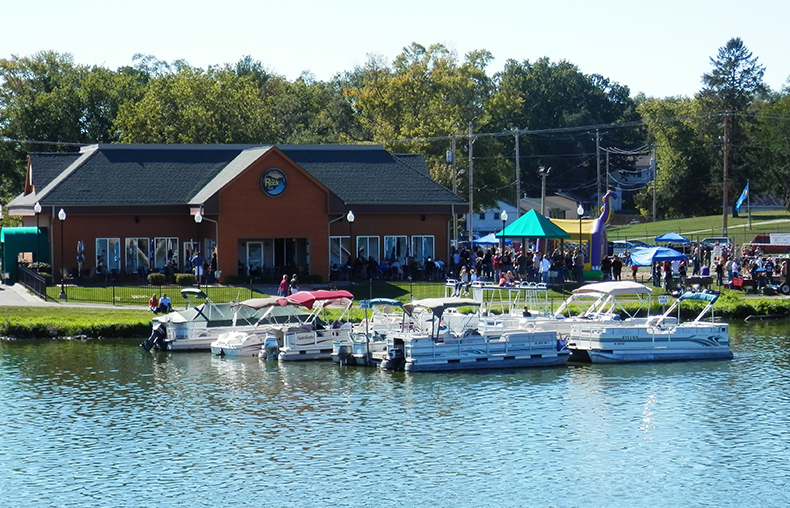 “On nice, sunny days you can see jet skiers, fishing boats and pontoon boats on the river.” The scenic riverfront location makes the Rock Bar and Grill the ideal place for company picnics, class reunions, birthday parties and other special events. Boaters can pull up right to the restaurant’s private docks. In addition, there’s outdoor patio seating and Tiki bar, a music stage, sand volleyball courts, beanbag boards, pavilion and a pontoon boat available for rent. The private docks are available for slip rentals. The Rock’s menu offers a variety of popular dishes. Entrees include steak, shrimp, chicken, salmon and pasta. There’s also an assortment of appetizers, tasty burgers, salads and sandwiches. Kids can choose from mini cheeseburgers to corn dogs to chicken tenders. The Rock features a Sunday breakfast until noon and a bloody Mary bar until 1 p.m, along with a meat raffle from 11 a.m. to 1 p.m. Birthday clubs are held on Tuesday that includes a free burger basket and pint of Sam Adams for the guest of honor. Trivia night is Wednesday from 7 to 9 p.m. Inside, the main dining room holds 72 guests, as well as a private room with room for 40 for meetings and special gatherings. There’s an attached boat house with three garage doors, as well as the Snapper Room, a room decorated to celebrate Beloit’s minor league baseball team. There are 15 TVs scattered throughout the restaurant.